Truck Dismount™ a.k.a. Rekkaturvat™ is the successor to the Porrasturvat™ a.k.a. Stair Dismount™ (see below). After half a year it has already received over half a million downloads from the game home page, and it has also been included in numerous magazines’ cover CDs and other websites for download. Like Porrasturvat™, this game was again made for a game development competition at the Assembly event (next year), and Truck Dismount™ won the competition. Flipcode IOTD I posted, has some insight into development of the Dismount™ games. GWJ interview with me about Dismount™ games. 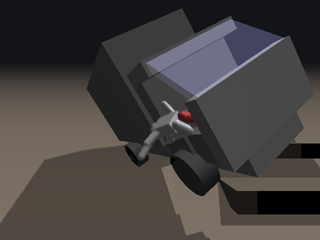 Truck Dismount™ – Rekkaturvat™ game info page in MobyGames. Game Tunnel review of Truck Dismount™. Dismount 4T – Fan site about Dismount™ games. Check the home page of Dismount™ games. will you make this for the iphone? Truck dismount is so fun. I really miss it though. Any chance of an iPhone port? I’m not personally involved with development of the Dismount series of games anymore, it is up to my friends at Secret Exit now. There is an iOS&Android version of “Stair Dismount” which has a wide variety of scenarios. The latest in the series is called Turbo Dismount, and I believe it will eventually be released for some mobile/handheld devices as well.